The Chinese regime’s grip on the Danish government has been exposed recently by local media. Some Danish politicians and experts have acknowledged their leaders’ mistakes in giving into China’s demands in exchange for trade deals. They have urged the Danish government to stand up against China’s human rights abuses. In 2012, Denmark signed a lucrative trade deal with China and turned a blind eye to the Chinese regime’s record of human rights abuses despite having obtained a classified document (ahead of the trade meeting) that reports on the atrocities. The contents of the document were released to the public in October by Danish media Radio24syv. The Epoch Times reported on Sept. 4 that about 50 Falun Gong practitioners and 150 Tibetans won a lawsuit against the Copenhagen police department. The case was called the “Tibet case” or the “Denmark Police Unconstitutional Case.” The 200 people participated in two separate peaceful demonstrations—one in 2012 during a visit by the-then Chinese leader Hu Jintao, and the other in 2013 during a visit by a Chinese delegation. The police violated the law by interfering with the protesters’ demonstrations (violation of freedom of speech). It was later discovered that the police were following direct orders from the Chinese embassy on how to deal with protesters during state visits by Chinese leaders. Danish media P1 Orientering published on Sept.19 a report about a secret document, dating back to 2004, from the Chinese Embassy that gave direct orders to the Copenhagen Police on how to deal with protesters during a state visit by a Chinese delegation in 2004. The document paid particular attention to adherents of the meditation practice Falun Gong as the main protesters that the police needed to watch out for. On Oct. 21, Denmark’s Radio24syv published a classified document from the Danish Embassy of Beijing. The document, from 2012, was sent to the-then Danish Prime Minister Helle Thorning-Schmidt on July 7 of the same year. The five-page document exposes the serious human rights violations by the Chinese Communist Party (CCP). It outlined the Chinese regime’s use of torture and executions on dissidents; detention and house arrest without trial or conviction; restrictions imposed on ethnic minorities and religious groups; restrictions on freedom of speech and freedom of the press; and severe penalties for any individual who supports independence for Xinjiang and Tibet in western China. One week after this document was sent to Thorning-Schmidt, the-then Chinese leader Hu was in Denmark for a state visit. Both countries signed a bilateral trade agreement worth $27.5 billion. Then what’s the relation between this secret document and the trade agreement? Andreas Boje Forsby, a researcher of Nordic Institute of Asian Studies at the University of Copenhagen, told Radio24syv that the contents in the document are topics that the Danish cabinet ministers and politicians tried to avoid when they met with the Chinese officials. The Epoch Times reported on Sept. 4 that about 50 Falun Gong practitioners and 150 Tibetans from Denmark and other Nordic countries received DKK 20,000 ($3,100) as compensation from the Copenhagen Police. Danish police had violated the constitution by engaging in the unlawful treatment of protesters from the meditation group Falun Gong and Tibetan rights groups at two separate incidents—one in the 2012 and the other in 2013. The Copenhagen Police issued a press statement on April 18 officially acknowledging that they had made serious mistakes in the handling of the protesters. Around the same time, Justice Minister of Denmark Soren Pape Poulsen, along with the Parliamentary Judiciary Committee, decided that all those who participated in the protests in 2012 and 2013 were also entitled to receive compensation—200 were eligible, according to the Copenhagen Police Department. In 2012, when the-then Chinese leader Hu visited Copenhagen, the police used four vehicles to block all the protesters from Hu’s view. Furthermore, the police took away the Tibetan flags from Tibetan supporters’ bikes, and arrested six Tibetans who tried to approach Hu. In 2013, when Yu Zhengsheng, the-then chairman of the National Committee of the Chinese People’s Political Consultative Committee, was visiting the Amerinburg Palace in Copenhagen, the police took away two Falun Gong practitioners wearing yellow t-shirts. Some Falun Gong practitioners staged a peaceful demonstration at the Palace Square. Soon after, the six Tibetans and the two Falun Gong practitioners filed a lawsuit against the Danish police. In Sept. 2015, the Danish Supreme Court heard the proceedings of the eight parties and demanded the police to provide evidences from the two incidents. In October 2015, the-then Danish Minister of Justice, Soren Pind, received an “Operational Instruction” from the police. It was a written order from the Chinese Embassy given to the Copenhagen Police. The document stated: “The protesters cannot be seen by Hu Jintao’s team.” Pind then set up a special committee to do a further investigation. The committee reported that the Chinese Embassy repeatedly emphasized to the Danish Ministry of Foreign Affairs that protesters should not be seen by the Chinese delegation during their visits in the country—this would guarantee a successful visit and lucrative trade deals. The Danish newspaper Berlingske reported that the amount of goods exported from Denmark to China doubled since 2012. But some experts question Denmark’s decision to do business with China despite its record of human rights abuses. “Therefore, the Danish government must ask itself whether (the question of China) has chosen the right strategy,” said Boje Forsby, a researcher at the Nordic Institute of Asian Studies. The case was called the “Tibet case” or the “Denmark Police Unconstitutional Case.” This is the first case in the world in which the judicial department of a country awarded compensation to Falun Gong practitioners. Danish media P1 Orientering reported on Sept.19 that they had received a secret document given to the Copenhagen police department from the Chinese Embassy on how they would handle the visit of Wu Bangguo, the-then Chairman of China National People’s Congress in 2004. 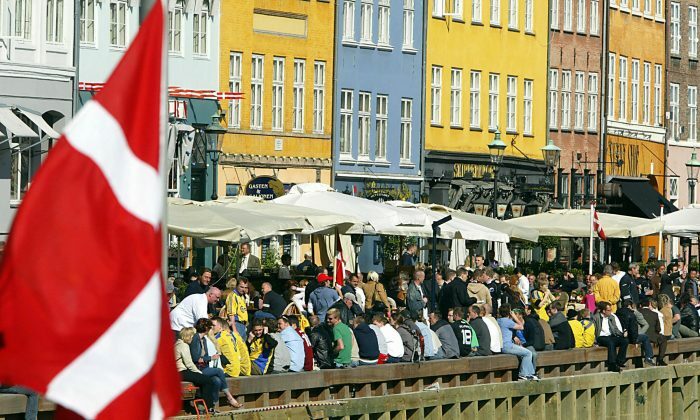 The 13-page document outlined Wu’s itinerary and the arrangement of police protection during his visit in Denmark from May 31 to June 2, 2004, as well as sensitive information on how to handle protesters. The document stated, “An official Chinese visit will be able to produce demonstrations aimed at human rights issues in China.” It also mentioned that about 100 Falun Gong adherents from Denmark, Sweden, Norway, and Germany were expected to meet in Copenhagen to protest, and that the protest should not disrupt the chairman’s visit. Wu was scheduled to visit the Little Mermaid, a popular bronze statue displayed on a rock by the waterside at the Langelinie promenade in Copenhagen. The document instructed police to keep the protesters in the dock area, away from the Little Mermaid, where they could not be seen. It mentioned potential protesters from the meditation practice Falun Gong. P1 Orientering interviewed two officers who took a lead role in executing the orders for Wu’s police protection. “We learned from the management to keep the demonstrations a little bit away from our visitors because they do not like some protesters and have a different opinion,” said Gunnar Sallov, one of the lead officers. Li Chen & Tong Zhen contributed to this report.